Looking for some functional artwork? You need the Twiggy Mirror. 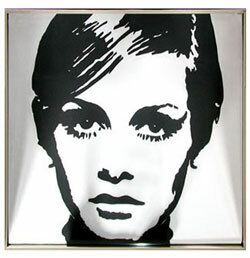 It was designed by Wendell Storm for Spazia, using a classic 60s Twiggy image imposed onto a mirror. Yes, a mirror – if you can avoid Twiggy’s model glare, you can use it to check your appearance or to add a sense of space to a room. Sized at 12-inches x 12-inches and in a brushed metal frame, it did retail for $250, but you can now pick one up for $199 (around £100). 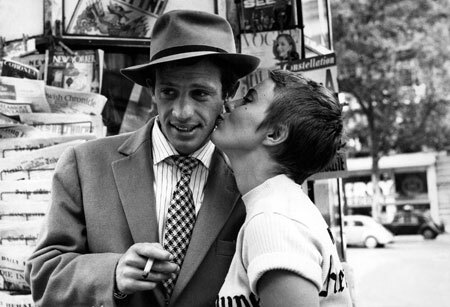 If you’re a fan of classic or French cinema, you may be interested to know that two new DVD boxsets have been released featuring two of French cinema’s leading men – Alain Delon and Jean-Paul Belmondo. Over at our sister site Cinedelica, both have been reviewed and rated – so if you’re considering buying, head over there first. In fact, if you want to keep up with classic and cult film and TV, make sure you check the site everyday – because there’s new reviews and features going up all the time. 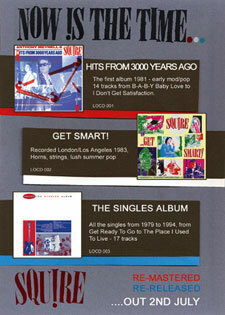 Hopefully you’ve checked out our review of the Take My Tip: 25 British Mod Artefacts From The EMI Vaults CD. But before you rush out and buy one, wait a minute – because we have five copies to give away. Just enter your details on the competition page and you could be listening to some obscure gems from the likes of Long John Baldry, Duffy Power, Chris Farlowe, Geno Washington, Rod Stewart and 20 more acts that I haven’t time to list. Thanks to all who entered. If you didn’t win, there’s a new competition now live for Take My Tip CDs. Hi-LO Records are re-releasing all the Squire albums on CD for the first time in original format, with original sleeve artwork. The first three, Hits From 3000 Years Ago, Get Smart! and The Singles Album are due out on July 2nd, distributed by Plastichead.com. The albums have been re-mastered by Denis Blackham from the original analogue tapes and come with 12 page booklets with extensive sleeve notes and pics etc.The Singles Album has been extended to 17 tracks to include The Young Idea single and The Place I Used To Live 45. If you want to know more about the band or indeed the reissues, check out the band’s website or their MySpace site.